So it occurred to me that you may enjoy looking at two paintings by Krieghoff that differ substantially from the paintings I have used in earlier posts. They feature dogs. 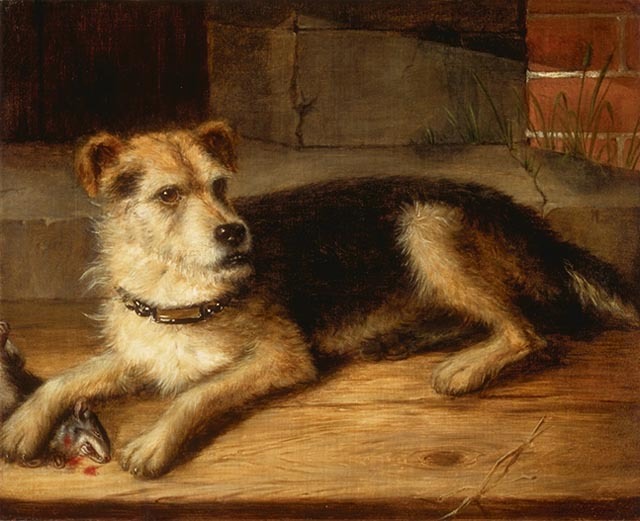 There are so many dogs in Krieghoff’s paintings that I suspect he always kept a dog. So did his habitants. But “The Pets and the Materials” is different and “Jerry” has a name. He is a pet and Krieghoff has painted his portrait. 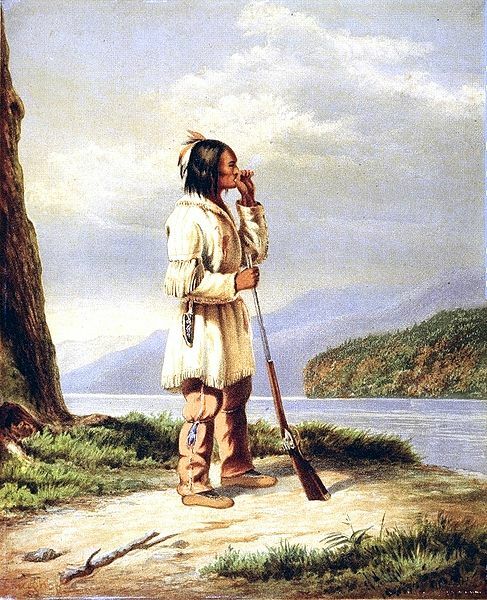 The last time we discussed Canada, the Rebellions of 1837 had been crushed and, in Lower Canada, 58 men had been deported to Australia, 12 were executed and the leaders had fled. In Upper Canada, where the Rebellion had been less severe, Lount, Matthews and Doan were executed and the leaders fled fearing reprisals and, possibly, death. 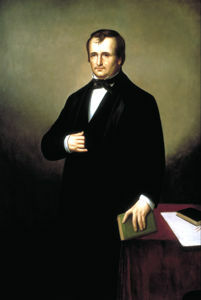 Louis-Hippolyte Lafontaine was appointed Prime Minister in 1842, a year after the Act of Union, with Robert Baldwin leading the western part of the new Canada. Lafontaine resigned in 1843 because Lord Metcalfe was opposed to responsible government, but opposition would not last. On the contrary, colonial officials were prompt to grant more autonomy to a people whose struggle for greater autonomy they had repressed in a very punitive manner. For instance, in 1843, the year he opposed responsible government, Lord Metcalfe pardoned the rebels who had been exiled, which was unexpected. Louis-Joseph Papineau remained in France for two more years, until 1845, but in 1843 the fifty-eight rebels who had been sent to Australia returned to Canada, now the United Province of Canada. As for William Lyon Mackenzie, he remained in the United States until the Amnesty Act was passed in 1849. 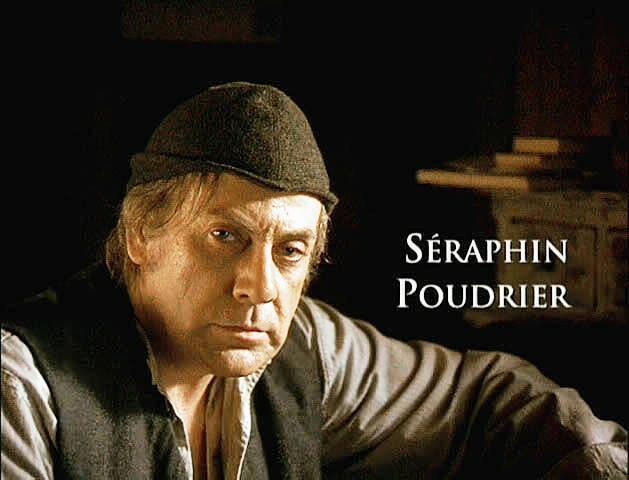 He was the one rebel who had not been pardoned by Lord Metcalfe. But, most importantly, in 1848, Lord Elgin, the Governor General of the Province of Canada, asked Louis-Hippolyte Lafontaine to resume his duties as Prime Minister of the Province of Canada, leading a responsible government. It is difficult to understand why, having crushed the 1837 Rebellions, colonial officials would agree to responsible government. Robert Baldwin and Louis-Hippolyte La Fontaine were moderate reformers, and it could be that colonial officials knew their resolve and took them seriously. Louis-Hippolyte Lafontaine, a member of Papineau’s assembly, had travelled to Britain in an effort to avert a call to arms. As for Lord Durham, there can be little doubt that he had harmed French-speaking Canadians. The Rebellions happened in both Canadas, which meant they could not be dismissed as yet another episode in the very long history of enmity, in Europe, between the English and the French. Such thinking was an oversimplification on the part of Lord Durham and too many questions remained unanswered. In all likelihood, there was patriotism on both the part of the French-speaking inhabitants of Lower Canada. However, among the rebels, several were English-speaking Canadians and Britain had helped itself to money levied in the two Canadas. As well, William Lyon Mackenzie was the last rebel to be pardoned. In other words, it would be my view that Lord Durham oversimplified the causes of the rebellions. Besides, his trivializing French-speaking Canadians was injudicious. However, he cannot be brought back from the dead to put his finger on the more complex and true causes of the rebellions, i. e. a struggle for responsible government. Nor can he take back his statement to the effect that French-speaking Canadians were an inferior people who did not have a history, and lacked a literature. So may he rest in peace. Let us now return to Robert Baldwin and his political partner, Louis-Hippolyte Lafontaine who “led the first responsible ministry in Canada, regarded by some as the first truly Canadian government.” [i] Baldwin and Lafontaine were not elected, but appointed to their office on the recommendation, in the early 1840s, of Charles Poulett Thomson, 1st Baron Lord Sydenham PC (Privy Council), the first governor of the Province of Canada. Although Lord Sydenham was anti-French, it would appear he was a good judge of character. Sir Louis-Hippolyte Lafontaine, 1st Baronet, KCMG [Order of St Michael and St George] (October 4, 1807 – February 26, 1864), was the second Primer Minister of the United Province of Canada, but the first Canadian to become Prime Minister of the United Province of Canada. I will also note that Louis-Hippolyte Lafontaine introduced the Rebellion Losses Bill in November 1849. It was passed, but Loyalists protested and burned down Parliament in Montreal. They were now nationalists, which may suggest that they had embraced Lord Durham’s assessment of the Rebellions: an ethnic conflict, and saw the Canadiens as the hereditary enemy of the British. But it may also be in everyone’s best interest to remember that, in 1848, there were nationalistic uprisings in a large number of European nations. Finally, I will also note that “[t]he Lafontaine-Baldwin government, formed on March 11, battled for the restoration of the official status of the French language, which was abolished with the Union Act, and the principles of responsible government and the double-majority in the voting of bills.” [iii] In other words, Lord Durham’s recommendation that French-speaking Canadians be assimilated was not implemented. As for the idea of a possible annexation with the United States, it died down. In fact, what colonial authorities now feared, as did Loyalists, was an invasion from the south. United Empire Loyalists had fled north in 1776, when the Thirteen Colonies declared independence from Britain: 4 July 1776. In 1755, the British deported thousands of Acadians but, in 1874, nineteen years later, the Quebec Act made French-speaking Canadians full-fledged British subjects. At first, there were difficult years on both sides. But, as stated in the Canadian Encyclopedia, after Canada was ceded to Britain in 1763, “new British laws respected the private agreements and the property rights of francophone society, and the seigneurial system was maintained.”[i] For details regarding this question, one can read Michel Brunet’s French Canada and the early decades of the British Rule (go to pages 3 and 4). The ROYAL PROCLAMATION OF 1763 renamed Nouvelle-France the Province of Quebec, but made it rather small, which would no longer be the case in 1774. 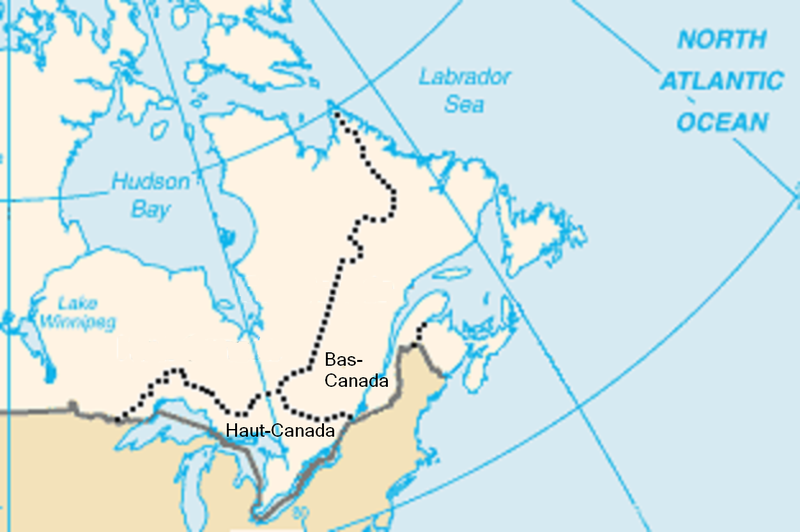 According to the Quebec Act, “which received royal assent 22 June 1774 and became effective 1 May 1775,”[ii] the Province of Quebec would “include Labrador, Ile d’Anticosti and Iles-de-la-Madeleine on the east, and the Indian territory south of the Great Lakes between the Mississippi and Ohio rivers on the west.” This enlarged Quebec would have an elected assembly and Catholics could be elected into office. The Quebec Act came into effect under General and Right Honourable Sir Guy Carleton 1st Baron Dorchester, KB [Order of Bath] (Strabane, Co. Tyrone, Ireland, 3 September 1724 – 10 November 1808 Stubbings, Maidenhead, Berkshire), Governor of Quebec (1768–1778) and Governor General of the Canadas (1786–1796). But Lord Dorchester opposed the Constitutional Act of 1991 that created two Canadas: Lower Canada and Upper Canada. I will discuss the Constitutional Act (1791), which Lord Dorchester opposed, in a later post. For the time being, it suffices to tell about the life of the Canadien after the Treaty of Paris. France could have kept New France but it preferred to keep sugar-rich Guadeloupe. However, the terms of the Treaty of Paris, which protected Quebec, were respected. It has been said that it was in Britain’s best interest to give full citizenship to the Canadiens in a formal Act, the Quebec Act. Its thirteen colonies to the South were threatening to part company with England. Therefore, why alienate the French Canadians? Yet, it has also been said that Britain acted in the best interest of its new British subjects. 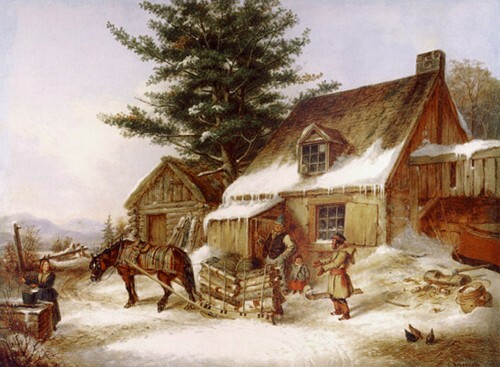 So, let us remember Cornelius Krieghoof’s quintessential Quebec: a snow land, un pays de neige: snow as a country. In 1844, the Krieghoffs travelled to Paris and Krieghoof made copies of works located in the Louvre under the direction of Michel Martin Drolling (1789–1851). 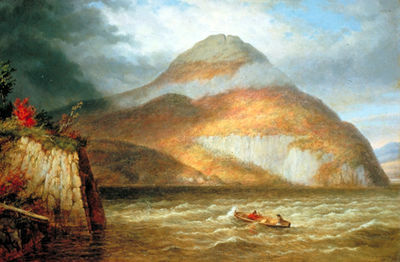 Krieghoof was invited to participate in the first exhibition of the Toronto Society of Arts, held in 1847. So the Krieghoffs returned to Montreal in 1846 and moved to Quebec City in 1853. Krieghoff returned to Europe twice. He did so briefly, in 1854, and at greater length, from 1863 to 1868. He then moved to Chicago to retire, and Chicago was his last destination. He died on 8 March 1872 at the age of 56 and is buried in Graceland Cemetery in Chicago. 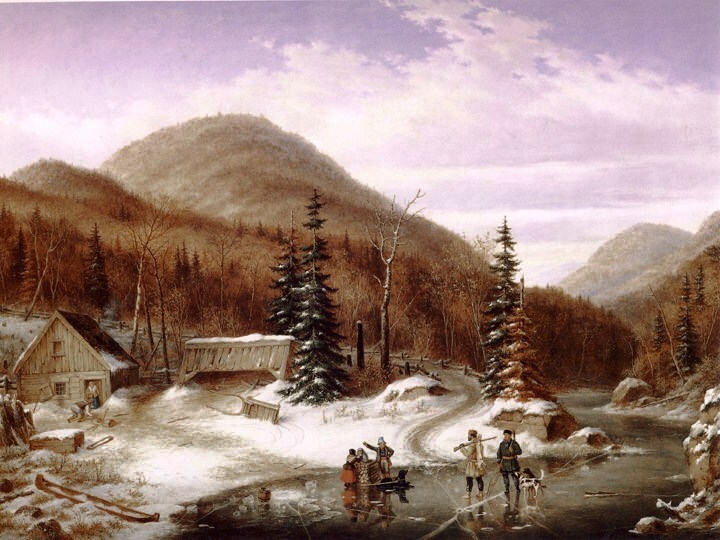 The Great Quebec Fire of 8 June 1881 destroyed many of his sketches, “then owned by John S. Budden, who had lived with the artist for thirteen years.” (Wikipedia). 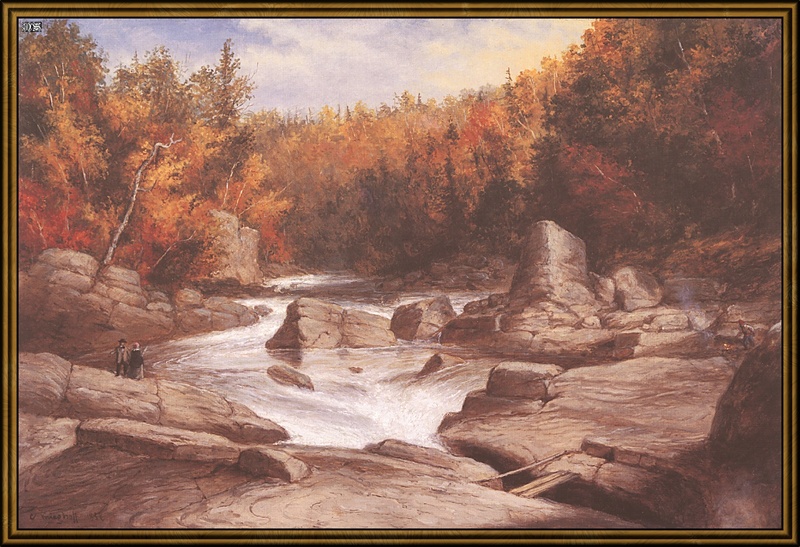 Cornelius Krieghoof is considered the finest Canadian artist of the nineteenth century. However, although called a Canadian, he could be labelled a Dutch master. 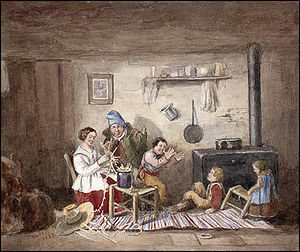 Just below is a painting of habitants, the name given censitaires or tenants under the Seigneurial System, abolished in 1854. They had been called habitants since the seventeenth century. The word has now become pejorative. The hinterlands would be Maria Chapdelaine’s Peribonka: les pays d’en-haut (the countries above), a story told by Frenchman, Louis Hémon. As for the aboriginals, when he served in the US army, Krieghoff was assigned for service in the Seminole Wars in Florida. Krieghoff had made sketches of the Second Seminole War. The Seminoles were Amerindians.